Below you will find our wholesale solid perfume scent lockets. Aroma therapy filigree pendant diffusers and necklaces. These can also be used as a simple picture lockets or cut some felt inserts and use as essential oil lockets to create a memory locket. 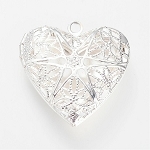 This page contains wholesale costume jewelry craft lockets. These are usually a plated raw brass and are often used as aroma or solid perfume lockets. It is very popular to place some type of highly scented soap or wax into the empty locket interior. This is often sold as having an aromatherapy benefit to the wearer. You may find that lockets of solid perfume provide a much stronger scent when worn. Traditionally people have put pictures inside but we also have customers that use them to keep a lock of a loved ones hair or even a small amount of ashes from someone who has passed on. Designs include hearts, book lockets, round, oval and stamped insets to mount a stone or cameo, We carry pad sizes that will hold a 40x30mm and 18x13mm cabochon or stone.